What does the Eastern Wood-Pewee sound like? The woods and fields are mostly quiet in afternoon these days. A few crickets singing, a cicada or two, the sound of an acorn dropping from an oak tree. You might even hear the solitary call of a gray tree frog, its voice breaking like an teenager’s. But you won’t hear many birds. Now that nesting is over and hatchlings have become full-fledged juveniles, the idea is to sneak around from place to place, make sure the youngsters learn the ropes, and—if you’re a migrating species—stock up for the long journey south. That trip is fast approaching. Not that all birds have gone silent: you’ll still hear the caws of crows as they gather to plan their large fall conventions; you’ll hear goldfinches in flight; you’ll overhear the conversations of roving bands of chickadees. And if you happen to find yourself deep in a mixed wood, you’re liable to hear the voice of an eastern wood-pewee. The pewee has a couple other songs, too. It’s “twilight song,” for instance, is faster-paced and includes a little hiccup. And just now in the woods, in mid- to late-afternoon, if you happen to pass through a pewee’s breeding area, you’ll hear it let just out just a single, abbreviated “Pee-WEE” call. You might then hear another some distance away. And even another farther distant. This call seems more of a “where is everybody?” alert in the event of a possible threat—like, say, when a man and a dog are passing below. I’ve heard it while hiking the woods of Beech Hill nearly every day for the past couple of weeks or so. 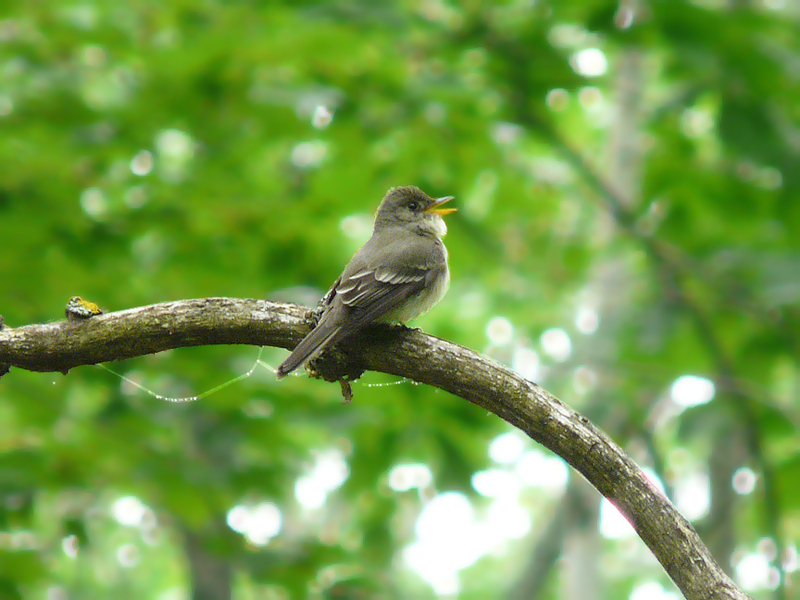 Considering they tend to hang out high in the understory, it’s not easy to spot a singing pewee. But if you hear its song above you—and can stand the mosquitoes long enough—chances are you’ll see one flutter off its perch on a bare branch or twig, snag a fly, then return to begin singing again. But it’s the song of the wood-pewee that does it for me, ranking right up there with the hermit thrush’s magic flute (the two species often can be heard calling together in the deep woods) among my favorite natural sounds in summer. Echoing off in the trees, it just seems to have the perfect blend of uplift and melancholy, urgency and reverie.